Bar seal is an ISO 17712 'H' & CTPAT compliant, high security, bar seal typically used to lock shipping containers central bars. 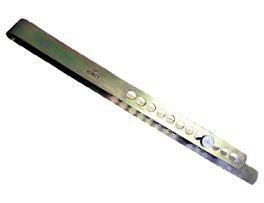 Each high strength steel bar is laser etched with sequential numbering and supplied with a snap on bolt seal locking mechanism with matching numbers. Adjustable locking positions for flexibility and precision. Matching serial numbers on bar and bolt provide additional identification and verification. Laser - stock items pre-printed with matching sequential numbering on bar and locking bolt head. As we have no control over the application and conditions our products are used in. We maintain it is the responsibility of the end user to determine that this is the correct product to suit your requirements. To that end we offer free samples and telephone guidance, please do not hesitate to contact us if you need help.